MegaSaw is a core drilling Melbourne company with over 20 years of experience in the concrete cutting industry. 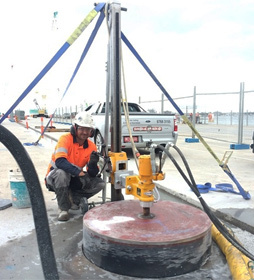 We are dedicated to providing concrete sawing and core drilling services throughout Melbourne and Victoria. We deal with both residential and commercial projects, and we use the latest tools for high quality construction work. Megasaw is your best choice when it comes to concrete cutting, wire sawing and other drilling services. The main purpose of core drilling concrete is to provide a way of cutting accurate and precise circular holes for electrical requirements, plumbing and mechanical purposes. We use the DMS 240 tool for our core drilling jobs. We use drills that are capable of drilling holes from 16mm to 1m. At Megasaw, our mission is to provide quality core drilling services for both the domestic and commercial projects. Even if there’s no electricity in your premises, we provide a special type of drilling, and use hydraulics to operate our tools. Our tools are regularly maintained and are in excellent condition, enabling us to finish your project in a timely manner. We provide service across Victoria and we have 10 Fully Equipped Vehicles ready to tackle any core drilling job. As one of the top core drilling companies in Australia, we are fully dedicated to our work output, that’s why we deliver outstanding results time and time again. We never leave a project until the client is 100% satisfied with the job. MegaSaw is proud of its experience and expertise in all aspects of cutting and core drilling concrete. Contact us for all your enquiry about the Core Drilling Services we offer. CALL US on 1300 920 419.